The sinking of the African slab, underneath the micro-slab of the Aegean Sea, created many volcanoes, forming a bow in the Southern Aegean Sea, and Patmos lies on it. Patmos (or "Latmos" in the ancient times) was the favourite island of the goddess of the moon "Selini"! Prehistorically the island was inhabited by the Karians! The island was later occupied by the Dorians and following that by the Ions! The name Patmos is believed to have derived from the name of the mountain Latmos in Karia, of Asia Minor. Moreover, it is said that Orestis found refuge in Patmos, passing through with the Argians, while being chased by the Erinnyes for killing his own mother Klitemnistra. All the walls in the area of Kasteli are back to the 6th and 4th Century and the various findings prove the existence of an "acropolis", where as it is believed, there were temples of the gods Apollo and Dionysus as well as a Hippodrome! According to the findings, especially those on the walls of churches, the social and cultural life of Patmos flourished during ancient times. The islands patron goddess was Artemis the Patmian, a figure of Ephesus and her temple was situated in Chora (Main town). On its ruins, the great basilica of Saint Ioannis the Theologian was built by himself and later the Monastery Saint Christodoulos. 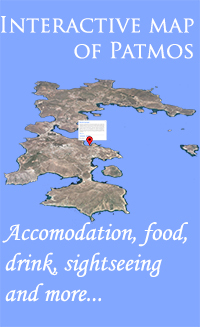 Following the occupation of the island by the Romans, Patmos fell into decadence! Most of its inhabitants abandon the island and the Romans thereafter use it as a place of exile! In the year 95 a.C, Jesus Christ's favourite student, John (Ioannis), was sent to Patmos in exile by the emperor Domitianus. This is how the meta-Christ history of Patmos begins. Yet, from that time until the 11th century there is a historical gap. During the 11th century, the presence of monk Christodoulos Latrinos, as well as the building of the Holy Monastery of Saint John the Theologian changed the situation and formed the civilization that developed in the time that followed. His eagerness for learning led to the formation of the first library of the Monastery, and settlements were created in the north of the island. In the 13th century, a licence was issued to build houses near the Monastery, so that inhabitants could be protected from the attacks of pirates that were tormenting the Aegean Sea. 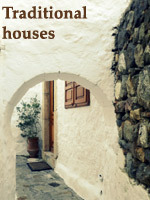 The first houses were built in the southern part, only with a ground floor at the beginning and as the desirable "anokatoga" houses of upper and lower basement later. The conquest of Constantinople by the Turks in 1453, was to bring a different "air" to Chora of Patmos, through the quarter of "Allotina" (Bygones) on the western side of the Monastery. Houses were adjacent to the walls of the Monastery, in order for the inhabitants to be able protect themselves from the pirates, by climbing up to their rooftops and in the Monastery. Although the inhabitants travelled far in the seas and brought wealth back to the island, the society of Chora was forced to live in the enclave under the town's "kamarika" (arches). The pirates from the East and Europe, if they to get through the five-door wall of the town, they would then lose their way in the mazy, dark alleys of it. So, the urban society of Constantinople transfers its civilization and organizes transit trade. Children studied in cities of the West. The manpower of the Monastery developed with almost 60 educated monks. Big and luxury houses were built and decorated with engraved furniture and embroidery. The end of the Venetian-Turkish wars and the decline of the pirates' attacks, the exploitation of the nautical tradition and the absence of the Turks, who only received taxes, yet still supported the Monastery, all created an excellent city. The port of the island was a bypass of traders from Venice, France, England, Italy and Holland. The Patmians built mansions on the most northern part of Chora, new, big churches and monasteries such as the one of "Zoodochos Pigi" and of "Evangelism". According to the traveller STOCHOVE, in 1630 the island already had a big, secure port. This was the first evidence of the existence of Skala, which gradually developed into a settlement. The traveller A. De la Monraye mentions that during that period, Patmos had approximately 4,000 inhabitants, 93 monks and over 100 churches, and another traveller counted 800 houses and 250 churches in Chora. The squares of Saint Levia and the Town Hall were formed. The trade centre was created, starting from the entrance of the Monastery, passing trough the Cretian area and reaching Saint Levia. Also, from the mansion of Calligas to the mansion of the Natalides family. The Hellenist and lover of the Hellenic civilization, Jacgues Lacarriere who praises Patmos in his book "The Greek summer" (L été grec Une Grèce guotidienne de 4000 ans) read by millions, admirably notes: "In some of the houses I saw well worked chests, painted separates, old portraits, and opal lamps, a world of past luxury that reminds me of aged salons of Athos?". As for the landscape, he says: "Worry bids of freshness that are nicely warmed up in the aroma of musty incense?" 1091 The Turks invade the island. 1113 The RUSSIAN abbot and traveller Daniel arrives at the island. 1127 Saracens, pirates attack the island. 1186 Norman pirates attack the island. 1191 King Philip of France visits the island, due to the Third Crusade. 1207 The island is occupied by crusaders. The Monastery asks the Pope for protection. The Pope accepts. 1418 Traveller Nompar De Gaumont arrives at the island. The existence of a second monastery is mentioned. The inhabitants are approximately 100, excluding the monks and they are mainly fishers and farmers. 1453 60 monks and as many foreigners are REGISTERED on the island. 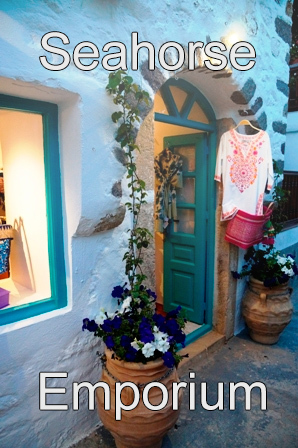 Approximately 100 immigrant families settle in Patmos and create a village. 1454 the island becomes the shelter of Metropolitan Bishop of Smyrna, Methodios, the Metropolitan Bishop Lykias Mathew and other victimized clergymen. 1457 the Church of 'Virgin Mary Diasozousa' (Saviour) is built. 1461 Pope Pios the Second excommunicates all those machinating the assets of the Monastery. 1480 The Knights of Ioannis dominate Patmos after defeating the Turks. 1600 The town Skala of Patmos is established as the place for mooring. 1646 There is a disastrous earthquake. The fixing of the walls follows using the donation of N. Mathas (1652). Skarpa of the North-East corner. 1684 A Monastery was founded by the monks of Capuchins. They were well accepted as they had knowledge of medicine and they taught Italian, the language of trade. A big Monastery building program was made by Neophytos Grimanis. 1713 The foundation of the Patmian School of the Nation. 1720 The grounds are divided between the Monastery and the people. In Chora there were 800 houses and 250 churches. 1820 Building of a temple of the Catholic of the Monastery trimmed with GOLD. 1999 Ounesco includes Patmos at world heritage monuments.